Talk to us on livechat, email us or call us for free advice on the best car bow for you. We construct you bows ready to use straight out of the box! Absolutely delighted with our big car bows, arrived really quickly and popped straight on the cars ! Excellent service again, thank you to all the team. The bows arrived ready for the dealerships to use, with the wrapping material and instructions. Brilliant displays for this Christmas promotion in every showroom. Thanks again. Couldn’t be more helpful from start to finish with advice, promised delivery and aftersales. What a find! 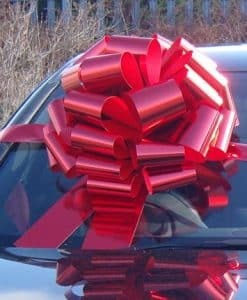 Our BIG car bows are perfect way to wrap big car purchase you make. 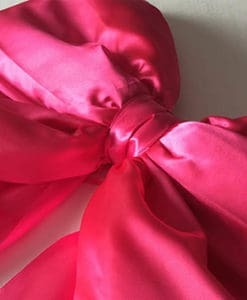 Our big bow making company are here in the UK, our bow makers can produce our big bows ready to use, there’s no construction necessary on our big car bows! Open the box and place on your gift in a few seconds. 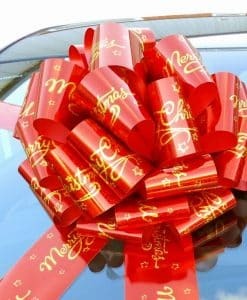 Our giant car bows can be made in big bow colours of your choice from a huge selection of materials in stock, we can even made 2 or 3 colour combination big bows to match your new car or corporate colours. 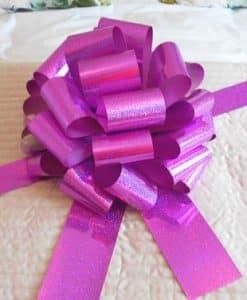 Need a large bow for a large present then our large bows are perfect, big bows made by big bow manufacturers in the UK, with a next day and free delivery option for our car bows in the UK. 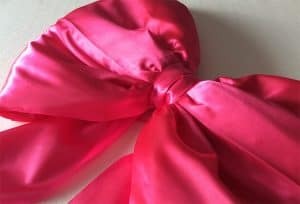 This big Car Bonnet Bow is perfect for new cars – measuring a generous 75cm across, 110cm from top of bow to end of tails, and 15cm high – the big car bow arrives with a magnet on the reverse to hold the bow in place to display. This bow is available in a huge variety of colours. 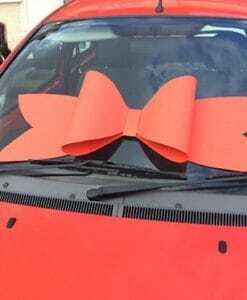 Our big car bows are perfect to be placed onto car bonnets, roof or windscreen, each of our bows arrive with attachments such as magnets, ties or sticky pads on the reverse to make using our big bows really easy. 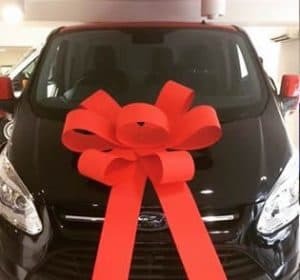 Your big car bows give your gift that extra WOW factor and you will see our big bows featured around the country, on TV and local shopping centres & car showrooms. 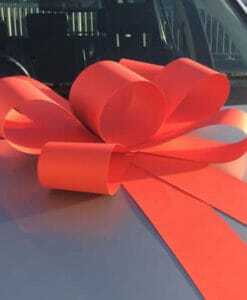 We offer discounts on our big car bows for trade and business customers. We can also offer personalised big bows with your special messages or business details for in-house promotions or new homes. 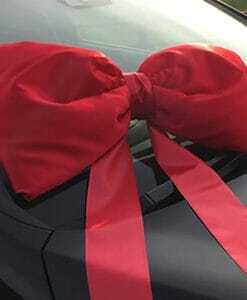 Our BIG car bows are now available in the UK for car dealerships from your big bow specialists. Bespoke big bows have been bespoke designed by our giant bow makers also available on request for PR companies and big event makers. 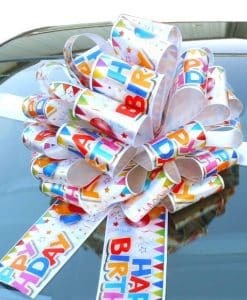 We can also supply co-ordinating extra wide ribbons to wrap your new car or extra large gift.